Put first 8 ingredients into large pot. Bring to boil. Cover and lower heat. Simmer for 20-25 minutes, stirring occasionally. Lentils will start to break up and soften. (If you like, you can cook until most of the lentils are soft and leave some of the lentils slightly firm.) Turn off heat. Put spices and oil into a small saucepan. Stir continuously over medium heat for 2-3 minutes until spices brown slightly. (Be careful not to burn the spices!) Add to soup mixture. Stir pot with soup and spices. Now, add salt and pepper to taste. 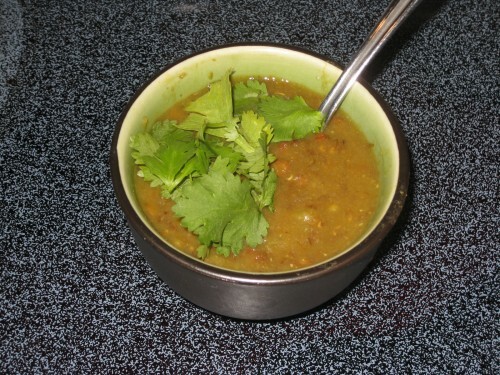 Pour into bowls and garnish with cilantro (and scotch bonnet pepper). Serve. The herbs and spices in this dish are great for regulating digestion. Energetically, the cooling effect of the celery and lemon balance the warming effect of the turmeric, cilantro, and cumin. Cumin is also known as Xi Hui Xiang in Traditional Chinese Medicine (TCM). Cumin harmonizes the Stomach, stops pain, and warms the abdomen. Cilantro is usually the leaf, while the seed is known as coriander. In TCM, cilantro resolves the exterior, enhances appetite and digestion.